WHiTE GLUE: Used on wood, paper or cloth, interior use only. Dries in several hours and has a moderately strong bond. Poor resistance to water and heat. Emits no harmfui odors. Cleans up with soap and water. YELLOW GLUE: Used on wood, paper or cloth, interior use only. Dries faster than white glue and has a slightly stronger bond. Moderate resistance to water and heat. Emits no harmful odors. Cieans up with soap and water. LIQUID HIDE GLUE: ideal for fine wood furniture or musical instruments. Interior use only. Sets siowfy. Has good bond and is resistant to solvents and wood finishes. An eye irritant Wlli clean up with soap and water. 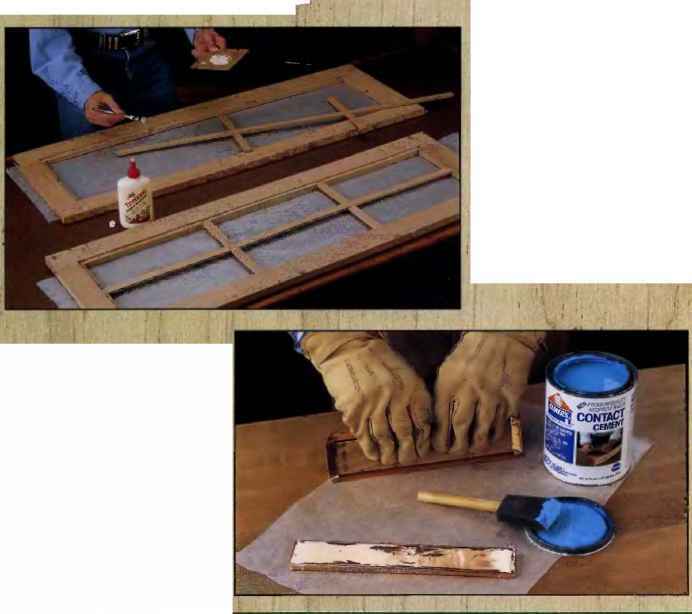 POLYURETHANE GLUE: Used to bond a variety of materials including wood, metal and ceramics. Sets quickiy and pro duces a strong bond. Waterproof. Warning; this giue can cause immediate and residual iung damage. This product should only be used with excellent ventilation. Asthmatics and peopie with chronic iung conditions should not use this product Cleans up with acetone or mineral spirits. CONSTRUCTION ADHESIVE: Used on framing lumber, flooring and roof sheathing, plywood and paneling, waiiboard, masonry. Dries within 24 hours and has a very good bond. Cleans up with mineral spirits. CONTACT CEMENT: loins laminates, veneers, cloth, paper, ieather, and other materials. Sets instantly and dries in under an hour. Produces a bond that is not suitable for structural applications. Very fiammabie and an Irritant to eyes, skin and lungs (non-fiammabie contact cement is also available). Cieans up with soap and water. HOT GLUE: Joins wood, plastics, glass and other materials. Sets within 60 seconds. Strength is generally low, but depends on type of giue stick. Good resistance to moisture, fair to heat. Heat will loosen bond. TWO-PART EPOXY: loins wood, metal, masonry, giass, fiberglass and other materials. Provides the strongest bond of any adhesive. Bond has excellent resistance to moisture and heat Drying time varies. Warning: fumes are very toxic and fiammabie. Cleanup sometimes possible with acetone. INSTANT (CYANQACRYLATE) GLUE: Bonds smooth surfaces such as glass, ceramics, plastics and metal. Has excellent strength, but iittia flexibility. Dries in just a few seconds. Has excellent resistance to moisture and heat. Warning: toxic and flammable, and the giue can bond skin Instantiy. 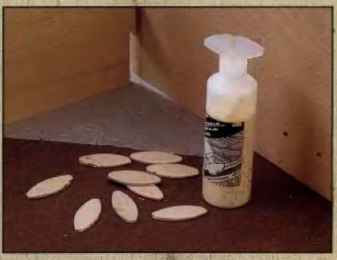 A SPECIAL GLUE TOOL FOR BISCUITS can be slipped Into a biscuit slot to deliver glue with no spillage or mess. A DISPOSABLE FOAM paint brush is a perfect tool for spreading even layers of contact adhesive on smaller project parts. For larger parts, like countertops, use a iow-nap paint roller sleeve. 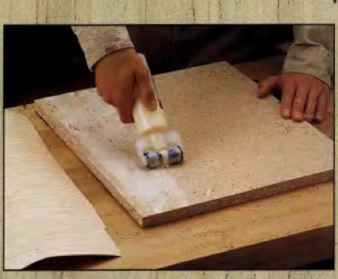 A GLUE ROLLER is used to apply an extremely even coating of glue en large, broad surfaces, such as when applying veneer. Once the hopper is ioaded with glue, it will dispense glue over the roller at an even rate when the surface is rojied. A GLUE BRUSH wili deliver just the right amount of glue to tight working spots. These disposable brushes more than make up for their low cost in savings on the clean-up side. 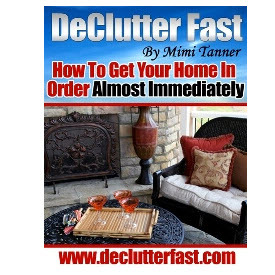 Is your home bursting at the seams with stuff? Is every closet crammed so full that any one of them is a death trap waiting to be opened? Has it been years since the last time you parked the car in the garage? Never fear, help is on the way. You need to get rid of some of that stuff. Dont you dare call it junk. Remember, one man or womans trash is another ones treasure!